Harry Reid successor: Chuck Schumer endorsed. When Nevada’s Harry Reid announced early Friday that he will not run for re-election in 2016, immediate speculation pegged New York’s Charles Schumer as Reid’s likely successor in the role of Senate minority leader. Schumer is a legislator who’s willing to compromise, seems to enjoy fundraising, and loves talking to the press, which are three traits the position demands. He also has a blue-state seat that seems unlikely to face a potentially embarrassing Republican challenge; Schumer won 66 percent of the vote in his 2010 re-election campaign. “I think Schumer should be able to succeed me,” Reid said in a Friday morning interview at his home in Washington’s West End. Reid predicted that Schumer, the No. 3 Senate Democrat in leadership and a close friend, would win the Democratic leader post without opposition. He said that the other likely contender, Senate Minority Whip Richard J. Durbin (D-Ill.), would stand down for Schumer. 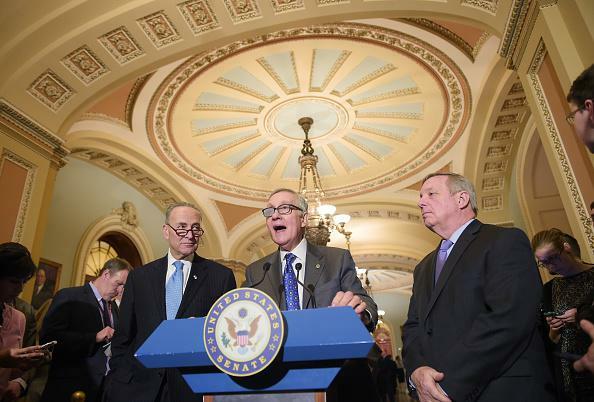 Durbin and Schumer don’t seem to have publicly commented on their plans yet. Elizabeth Warren, the prominently liberal first-term Massachusetts senator beloved by activists, says she will not seek to become Reid’s successor.